The Excavator: Meet Jamal Maarouf, Syria's Most Moderate Rebel Leader Supported by the US Govt. 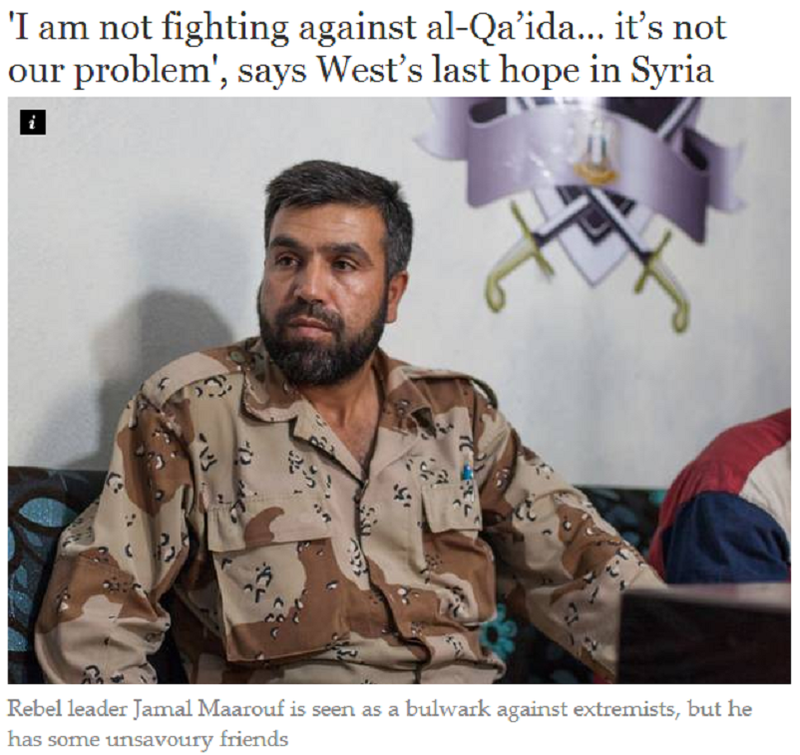 Meet Jamal Maarouf, Syria's Most Moderate Rebel Leader Supported by the US Govt. Maarouf says he would be open to Western support, and it's not hard to see why his political and religious views make him a potentially attractive partner for those concerned with the rise of Islamist extremists. "I love my country and I am a practicing Muslim," he explains, "but my religion preserves dignity and freedom for other people as well." The rebel commander says he's fighting for an inclusive Syria with a representative government: "The real Syrian people don't like terrorism or extremism, they're a tolerant people," he says. Maarouf's lack of any defined ideology had led to condemnations from rival groups that he had joined Syria's war for little more than his own enrichment. Hassan Aboud, a leader of the Salafist brigade Ahrar al-Sham, has called Maarouf's men "gangs," accusing them of attacking and stealing from other members of the opposition. After the Islamic Front, an umbrella alliance for Islamist militias of which Aboud is a top official, was accused of pillaging warehouses being used by the Western-backed Supreme Military Council, Aboud shot back, saying that Maarouf "should not forget he was one of the first to steal from the Free Syrian Army." As a result of such condemnations, support for his Syrian Martyrs' Brigade dwindled throughout much of 2013. "In terms of the Syrian conflict all together, I think he's predominantly been seen as an opportunist," says Charles Lister, a visiting fellow at the Brookings Doha center. "For a period of time prior to the formation of the SRF under his leadership, his popular support on the ground had reduced significantly and he was almost decried within certain circles." Jamal Maarouf, the leader of the so-called "Syria's Revolutionary Front" (SRF) is considered by the West as the most moderate rebel leader. This interview sheds a light on the man that claims to the Independent to be not willing to fight al-Qaeda's Jabhat al-Nusra - his allies with whom he conducts joint operations - because it is not his problem, but a month later portrays himself to al-Aan pan-Arab TV station as someone who opposes extremists. His fight against the "Islamic State in Iraq and the Levant" (ISIL) is based on conflict of interest, where even al-Qaeda's Jabhat al-Nusra is fighting alongside him against ISIL because of shared interests. He confirms during the interview that his group has received American aid and weaponry such as TOW missiles. He also confirmed that he had sent several men from his group to attend training sessions by US special forces.